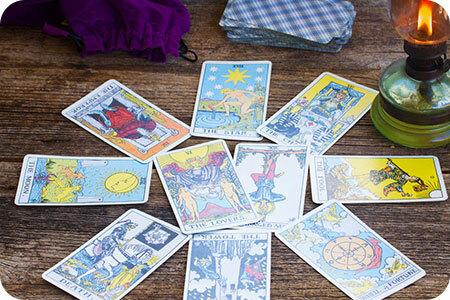 Most Tarot decks are made up of 72 cards, which include the Major Arcana. These cards refer to the major events of our lives, while the Minor Arcana cards tell the stories of our everyday events. The Minor Arcana is made up of four suits: Wands, Pentacles, Cups, and Swords. Wands relates to the element of Fire, Pentacles to Earth, Cups to Water, and Swords to Air. The court cards symbolize people and the other cards symbolize events and situations the querent is experiencing, or will experience. In astrology, the twelve Zodiac signs consist of three signs per element. These sun signs change from one to the next on dates that relate to the solar changes around the 20th to 22nd of each month. Aries, Leo, and Sagittarius are the Fire signs. Pisces, Cancer, and Scorpio are the Water signs. Taurus, Virgo, and Capricorn are the Earth signs. And Gemini, Libra, and Aquarius are the Air signs. The Zodiac therefore adds an additional layer to a Tarot reading, with regards the dominant suits in the spread, timing of events because of the months that the cards relate to, and personality because of the general personalities of each sign. In general, Wands or Fire symbolize energy and passion; Cups or Water symbolize emotional energies, intuition, and dreams; Pentacles or Earth Symbolize money and practical matters; and Swords or Air refer to problem-solving, intelligence, the arts and sciences. Most readings have a combination of these energies and the reader combines the card meanings and pictures with intuition to complete the story. Astrology is changing, because of the recent earth changes. There has always been much speculation about the 13th sign Ophiuchus, and I have found that indeed, people born in that roughly two-week time frame after Scorpio ends, have different personalities than others born under the sign of Sagittarius. I take this into account when I do Tarot readings. I read Ophiuchus as a Fire sign and another aspect of Sagittarius, so we keep the 12 signs, but because it is the transition between Scorpio and Sagittarius, I refer to it as a ‘hot water’ sign, the combination of fire and water, and attribute more elements to it such as the caduceus and healing. To add to the confusion, our zodiac sign dates have changed to include Ophiuchus, because of the changes in the Universe. However, for the purposes of reading Tarot, the traditional ways of reading still work for me, especially when I use my intuition for the time and personality changes. So, if you are really in love with the sign you believed you were born under, do not worry. In my opinion, you do not have to buy new birthstone jewelry, or change your tattoo. The sky was much different at the time you were born if you are old enough to read this. The recent earth changes are part of new universal changes, and too many to describe here. Because of these changes, you may want an update on your very young children’s signs.